Growing up in a northern suburb of New York City with no sidewalks or public transportation, driving a car was a necessity. It was also something that I avoided as often as possible. So arriving on Ambergris Caye and seeing only a few cars, most of which are taxis, I couldn’t have been happier. The two most common methods of transportation on the island are golf cart (!) and bike. Golf carts are treated in the same manner as cars in the sense that each has a Belizean license plate on the back and needs to have insurance. When 16-year-olds are ready to drive, they take their road test in a golf cart! Tourists are able to rent a golf cart with their regular license, but I decided that this summer I would be biking on Ambergris Caye -- my favorite method of transportation. I went to the hardware store to purchase a bike lock and was a bit concerned when I didn’t see any of the higher security ULocks. Ever since my bike in the States was stolen (and a few of my friends’ bikes too) by a quick clip of their cable lock, I have been programmed to always opt for the ULocks. As I picked up a combination cable lock to examine it, I realized that all the bikes on the island had the same type of lock as was in my hand. Then I remembered what my American neighbor at Grand Baymen mentioned to me, “If you see my bike around, feel free to use it. 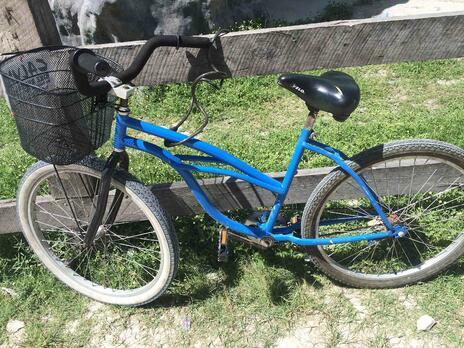 It doesn’t have a lock but should surface sometime soon... it always does.” With that my mind was at ease, and I was finally ready to enjoy my first experience biking on Ambergris Caye. Hopping on my bike, I took off to downtown San Pedro; no more than a five-minute bike ride from Grand Baymen. Well, it would have been five minutes if I hadn’t been stopping to look at all the colorful buildings and bright blue Caribbean water. The pace of my ride was reminiscent of the first time I rode down Saint Charles Avenue in New Orleans, but here there were no honking horns. And I certainly don’t have to worry about getting run off the road by an SUV when biking on Ambergris Caye. For the first time, my lackadaisical speed was an acceptable pace. On Ambergris Caye, not only are you allowed to stop and smell the roses, but that is what you are supposed to do. The views are too just captivating to simply breeze by them. It's a community in San Pedro, and one that I am excited to continuing exploring --- via bicycle.